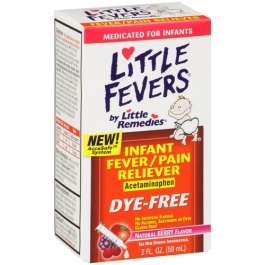 Little Fevers by Little Remedies Pain Reliever is a good choice to temporarily reduce your infant's fever in a time of need. This medicinal aid will assist in relieving an infant's minor aches and pains, which can often times be associated with a cold, flu, headache, sore throat or toothache. The Berry Little Remedies for fevers 2 oz. size also features a helpful AccuSafe system. This feature helps to ensure safe and accurate dosing.